"Tapestry" is a digest of original fiction in the tradition of the pulp magazines and penny dreadfuls and dime novels of years past. We strive to impart old-world sensibilities into our work and hopefully instill a modicum of the wonder that faded with a bygone era. 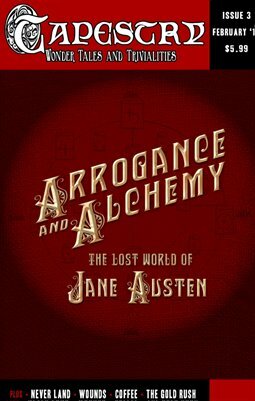 In this issue, "Arrogance & Alchemy," find the wonder of lost worlds, of rich drink, and of fool's gold. Tapestry: Wonder Tales and Trivialities is issued monthly.